Hollar was born in 1607 in the very dynamic and artistically booming city of Prague. From an early age, Hollar visited printer stalls and artist’s studios and was even known to design maps in school. His father highly disapproved of his son's choices and encouraged Hollar to go into Law but after the war that was raging in Bohemia ended, Hollar emigrated to Europe and followed the path he believed was destined for him. It’s in 1631 that he commences his life as an engraver in Frankfurt. His engravings remained very objective, he illustrated a wide variety of things but never interpreted them. Hollar’s interests ranged from costumes, animals, plants, buildings, ships and landscapes of his time, all of which he recorded with extreme precision and diligence. His very unique perfectionist style was not universally appealing and often criticized for its overabundant lines. 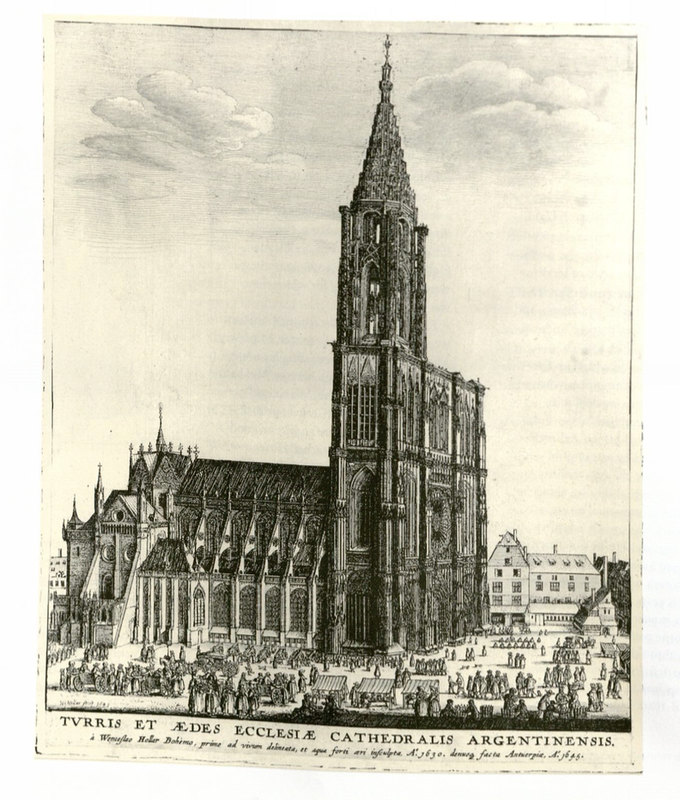 An engraving of the Strasbourg Cathedral in contextual space in 1630.
of perspective and shading already at a very young age. At not even 30 in 1636, he was selected by the Earl of Arundel to be his artist in residence in England. For the next decade Hollar remained in the Earl's household which gave him many privileges such as being prince Charles drawing master in the 1640’s. His first major work in London was entitled The Long View of Greenwich published in 1637. In this engraving we see how smooth and gradual the transition from foreground and background are which suggests Hollar had a great knowledge of depth of field. It is said that Hollar's detailed engravings of nature brought to England a new approach to landscapes, “He influenced the tradition that previously favored painted portraits and miniatures and considered landscape primarily as a background’.’ Dogged R, L Biggs J, Brobeck. C. Impressions of Wenceslaus Hollar, 1996. Many of his landscapes maps and architectural engravings of London are very helpful for Art Historians today in order to understand what the city looked like before the destructive Great Fire of London in 1666. St. Pauls cathedral was one of the most important and impressive cathedrals at the time in London. 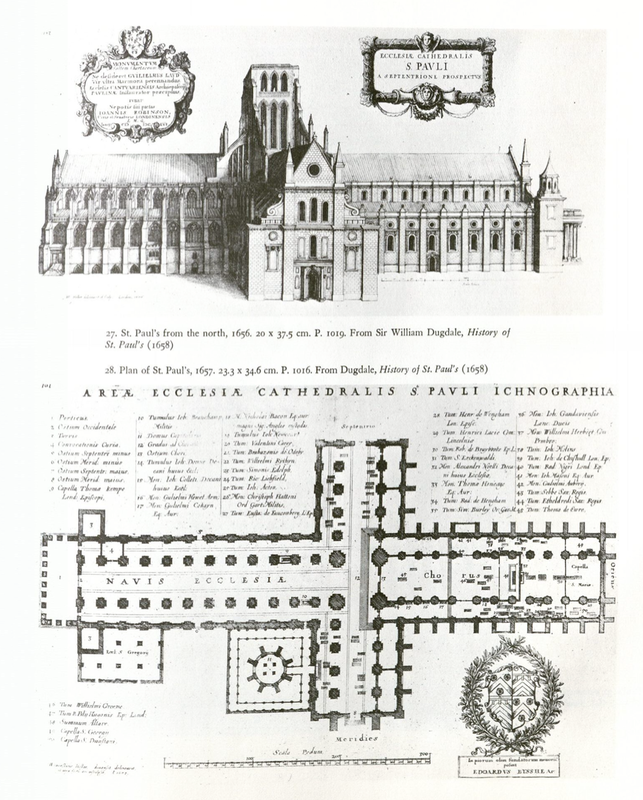 Hollar’s illustrations was made up of a series of fourteen highly detailed engraved views of the inside and outside of the Cathedral, and close-up images of the most important monuments and tombs. 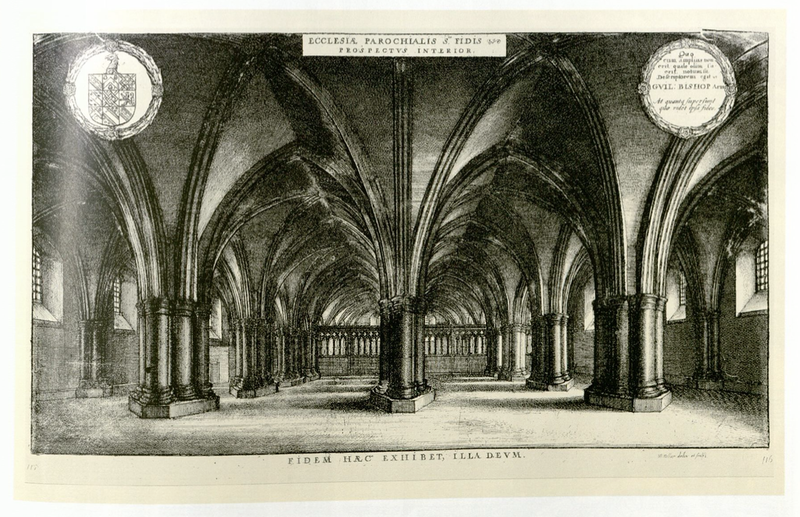 (Artdaily.com, Detailed Drawing of London's Old St Paul's Cathedral to Be Sold at Sotheby’s). Hollar also used to do engravings of the people of the 17th century thus reflecting the society and its various classes which is very valuable knowledge for social historians today. 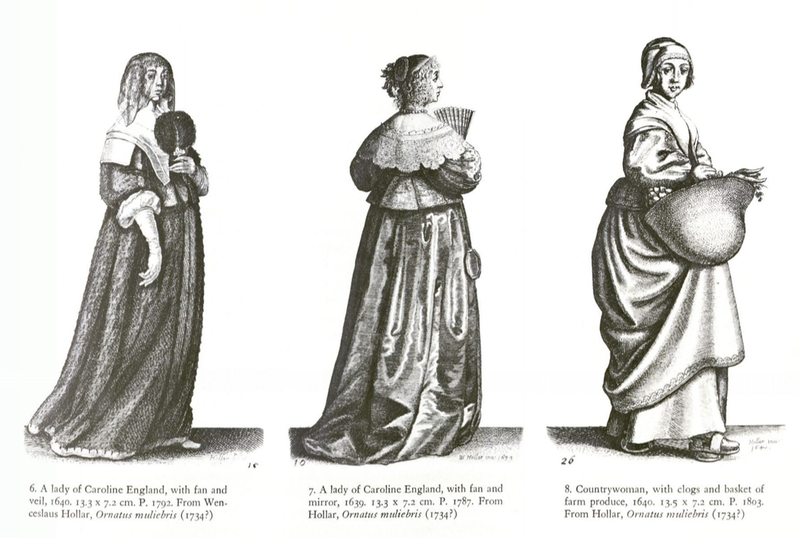 In these particular engravings dated between 1638 and 1640, Hollar portrays the lady of the Caroline England (left with fan and veil, middle with fan and mirror) and a countrywoman with clogs and a basket. Here Hollar’s meticulous nature is particularly visible. The lack of background on these engravings demonstrates Hollar wanted the viewer to focus on the figures and the texture of their costumes . 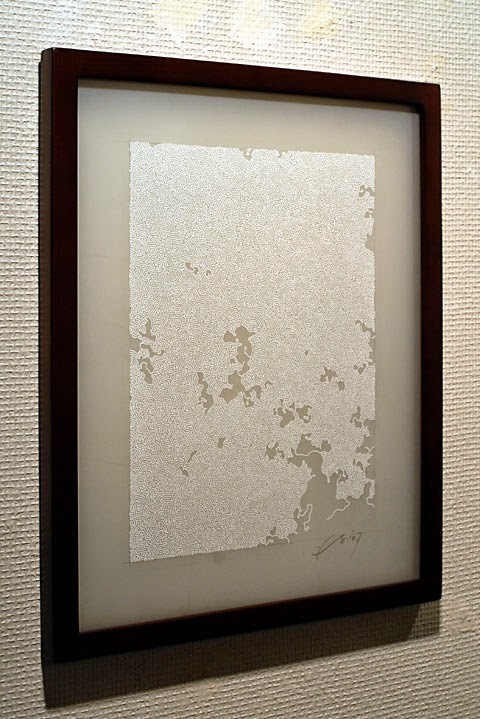 In terms of technique, the engraving that Hollar used is considered a part of intaglio printmaking. I chose this artist because his work is extremely refined and precise, which is very intriguing to me because my work is the complete opposite. His ability to reproduce the world of the 17th century around him wether it be portraits, animals or buildings in a fantastically accurate way is why this artist is so impressive. Because of his skills many historians are able to visualize what life in London was like during that time period. 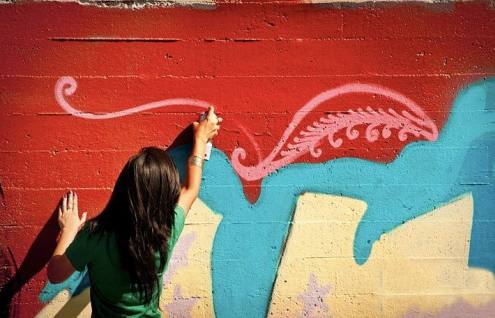 Nisha Semba is the first known South Asian American female graffiti artist, a modern contemporary artist whose works explore the juxtaposition of heritage/culture and modernity. She uses her work with youth in India as a platform to address and impact social change, self reflection, and decolonization. Semba was raised in Berkley, California and attended San Fransisco State University’s Design and Industrial Arts program, gaduating very recently in 2011. Semba is the founder of the Kalakari (“Artistry”) movement, and has earned a name for herself as the first ever Indian graffiti writer to paint her name at the centerpoint of graffiti- 5Pointz in New York City. 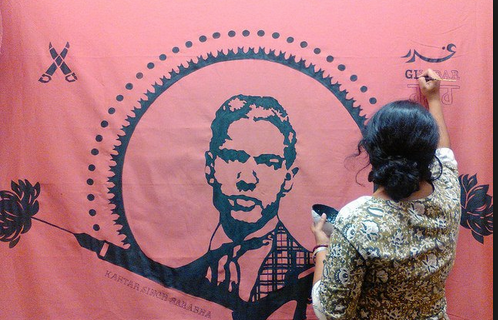 She currently works as a freelance graphic designer and has been doing mendhi (henna) design for over ten years. 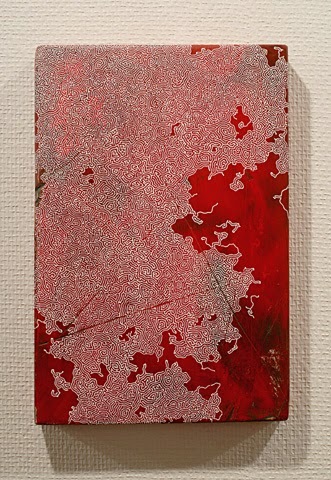 Her work has been shown in venues in California, at the deYoung Fine Arts Museum and The Living Room Cafe (Delhi). 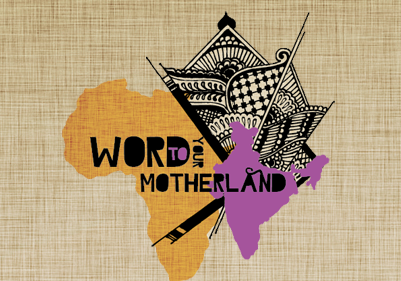 Her website advertises “her most recent mixed-media solo exhibit called Word to Your Motherland (2012) that took place in Oakland, California and again in Sacramento California (2013); which has evolved into a dynamic new international exhibition series with educational workshop components that is the first of its kind.” The purpose of the project is to inspire new ways of engaging with the homeland and place of cultural origin within their medium and aesthetic. 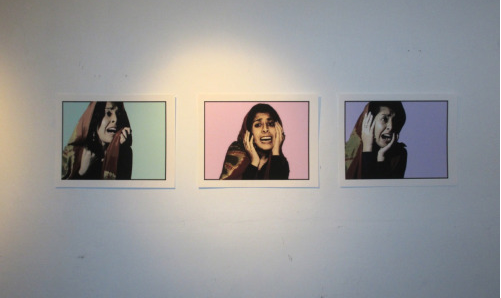 Semba uses a variety of different mediums; amongst these, she focuses on digital, fine art, and graffiti/street art. 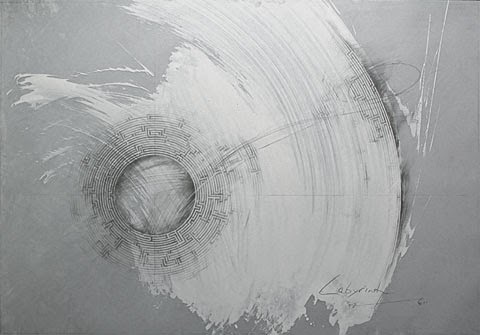 She frequently collaborates with other artists in exhibitions with similar themes, and has historically preferred to work with audio-artists (spoken verb artists, rappers, and singers) in holistic exhibitions. 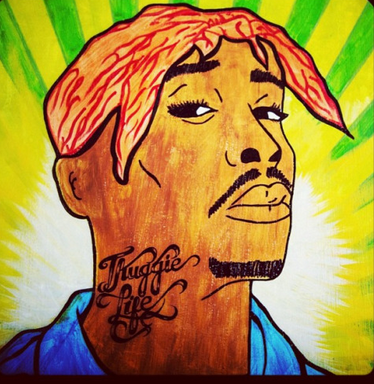 Much of her artwork finds themes in hip-hop and female roles. It is particularly interesting to view images of femininity juxtaposed with the harshness of pop-style art and graffiti medium. 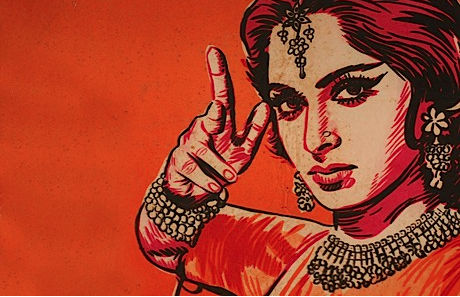 Additionally, a common trend in her pieces is the use of design henna and mendhi, which seems to be indicative of a reclamation of heritage. 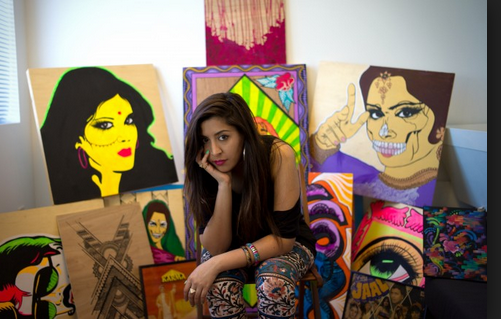 The flavors of her art resonate with South-Asian American youth; her work is particularly applauded and featured in groups like The Kajal Collective and The Dead Shayar Society- informal international groups that connect young artists. 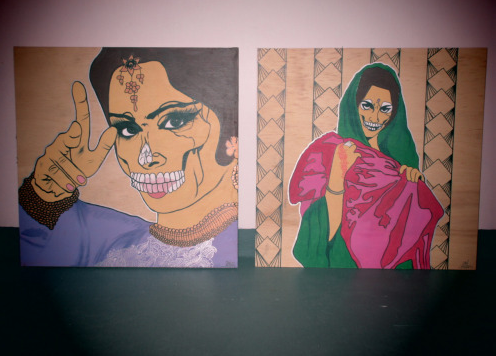 Although Semba is a unorthodox choice of artist to be studied, I believe that she reflects a larger movement of Indian-American and British-Indian artists who explore intersections between societal norms, cultures, and youth. This movement has a similar flavor to “The Namesake” movement, which addresses South Asian immigrants- one generation before our own. 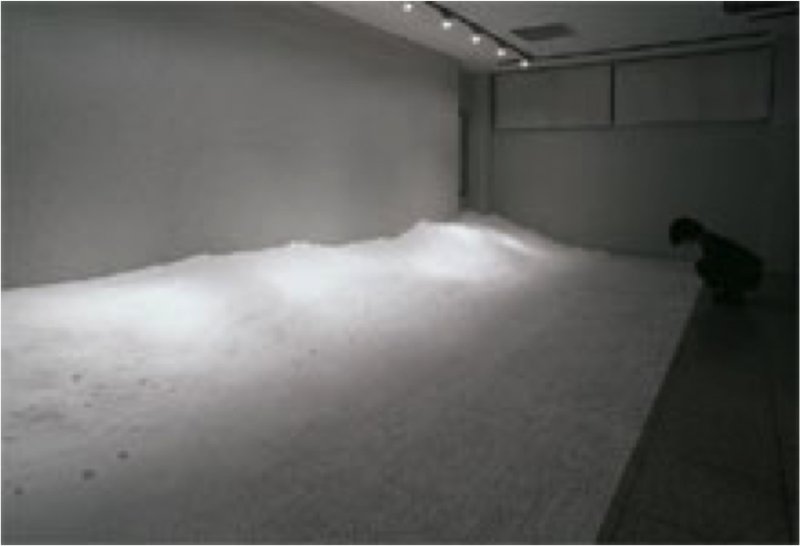 The collection of works, manifested through primarily film and literature, express a yearning to return to the motherland. Meanwhile, the movement that follows it, including Semba’s work, calls for confusion of home and a call to a culture that was never their own. It also holds expresses a degree of chaos and rebellion. There are many movements much like this one that are occurring all across the globe as a result of internationalization and capitalism. These youth-based movements represent a phase and form of modern and digital art that is raw, expressionist, and will be important to historians and future generations. While these art pieces may not always been printed and shown in galleries, the sale design t-shirts and the online print sales show a new kind of arena for the artists world in which the art literally permeates through to the real world, and no longer can remain restricted to the confines of a four-walled gallery. Personally, it serves as a wonderful inspiration for my own work and an interesting cross-section of the areas of art that have typically been very . Given the cultural contexts of these pieces, there is a strong sense of shock that is often associated with "Modern Art". In many ways, however, Modern Art- whatever may seem to fall under its title- has lost the ability to shock, or can only do so mutedly. 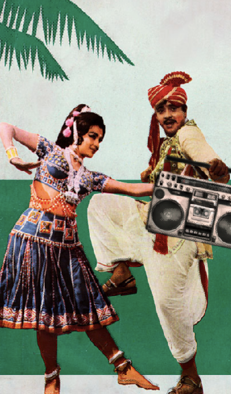 Overlooked modern art in south asian cultures, however, has not yet fallen pray to this predicament and continues to shock, interest, and revolutionize. "The Shadow World of Alfred Kubin"
A quick look through the works of Alfred Kubin should leave no doubt as to the reality of his inner demons. 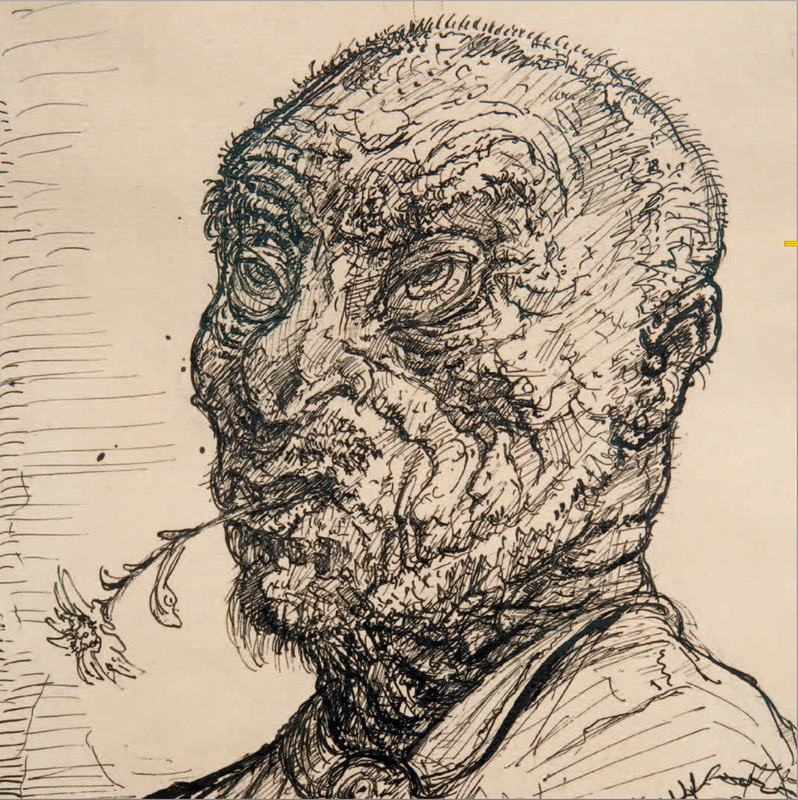 Born in 1877, the Austrian printmaker's troubled childhood began with the death of his mother when he was ten years old. His consistent failure in school earned him the disdain of his father, a former military officer, who would beat him and "[talk] to him as to a sick cow." At fifteen, he was apprenticed to a landscape printmaker, but found no success. As for his love life, his affections never found reciprocation. At nineteen, his despair reached a climax: "A dull depression swept over me, and... I left for the faraway town of my childhood, with a cheap, old gun in my pocket, to shoot myself at the grave of my mother." The firearm misfired, and Kubin, unable to pull the trigger again, would live on to create the creepy images to which he was so one-sidedly committed. I had recently learned of Alfred Kubin through the cited article in The New York Review of Books, whereupon I immediately encountered The Moment of Birth (1903). 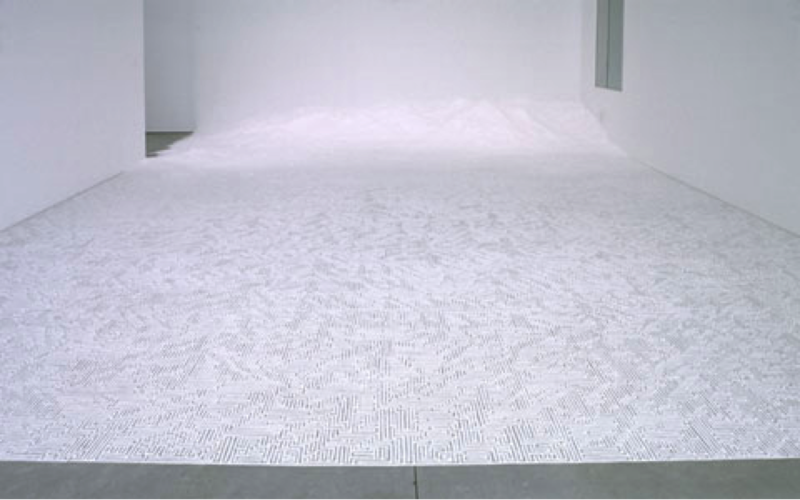 What struck me about the work was the understatement of its horror, and the puzzling narrative it presented. 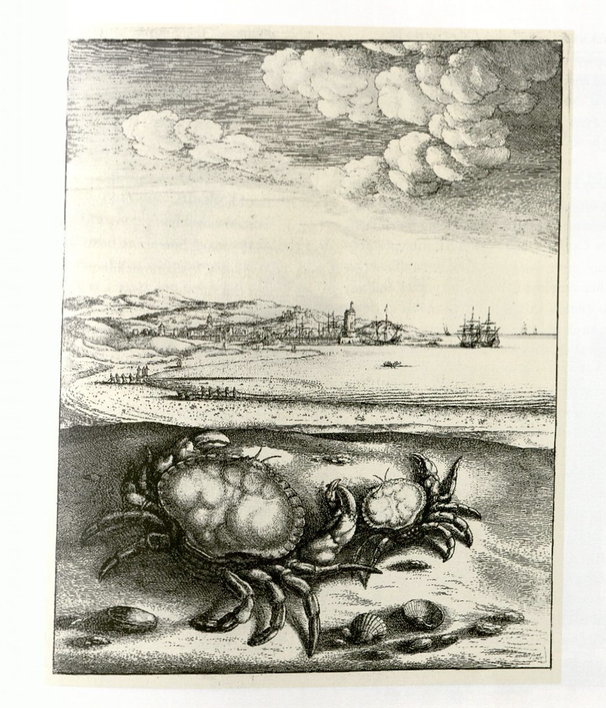 Its gray-cast depiction of this bizarre crab/spider-like monster flinging babies from the water gave me the feeling I was a silent observer of this grotesque dream. And what is it even about? Where do these babies come from? Where are they going? 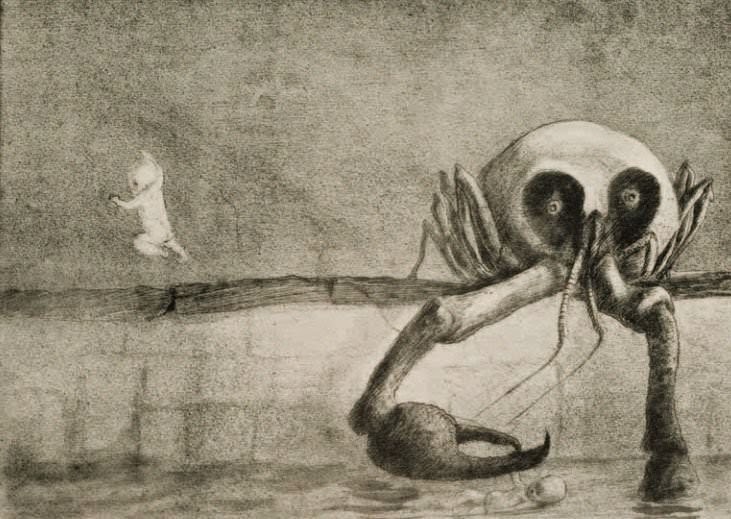 Such weird (often spidery) creatures are commonplace in Kubin's work. Equally commonplace are distorted depictions of humans, as in Old Man with Pike (c. 1920/25). The portrait of the man is accurate insofar as overall shape and proportion are concerned. Instead, the distortions are of the features: deep wrinkles which sort of remind me of the layers of dried lava folded over itself, and a severely indented nose. 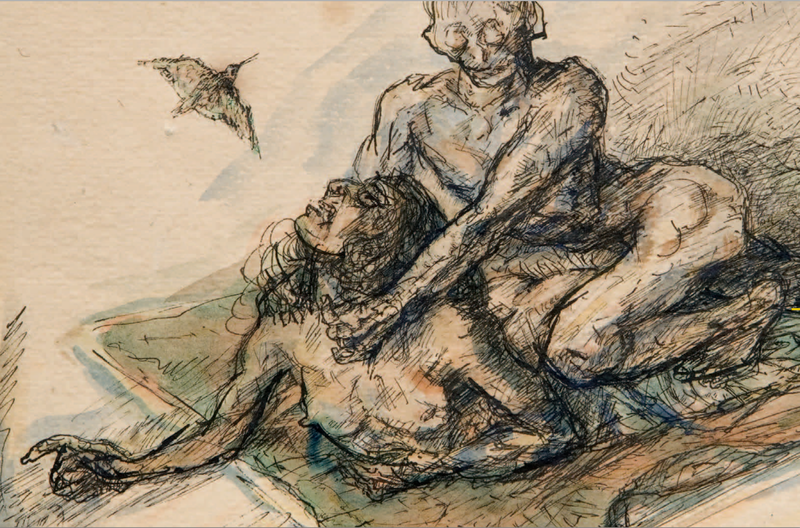 Another common theme of Kubin's work is the entanglement of sexuality and violence. Take, for instance, the gesture-like Strangler (c. 1918/20). The stray lines animate the actors, making the violence overt and immediate. Similarly there is The Spider (1902), which, in particular, presents another commonly found notion in Kubin: that of a woman as temptress and destroyer. I suspect that the principal source of my fascination with Kubin are the puzzling narratives of his work. They don't always work for me however, and in fact, I don't much care for any but the first of the images I've posted here. But The Moment of Birth and other works of his like it succeed in truly disturbing and confusing me. Looking at these, I feel like Alice in Wonderland, a foreigner in a world where strange creatures and people abound. But in this dark place of the imagination of Alfred Kubin, there is sometimes a sense of haunting familiarity. Egon Schiele was born on June 12, 1890 in Tulln, Austria. 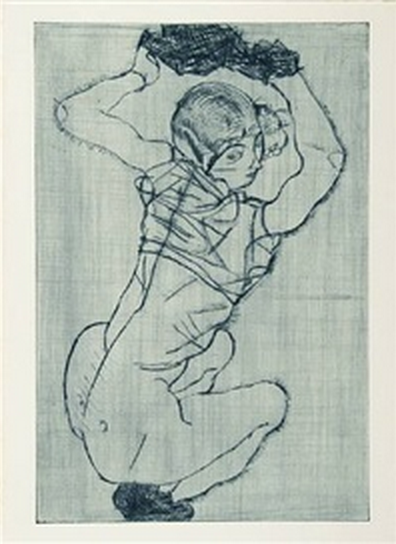 Schiele is commonly known for his precocity in art. Not only did he start drawing at a very young age, but also he was extraordinarily quick to learn. Some of his most famous pieces of work were created when he was only seventeen years old. Schiele died on October 31, 1918, which means he was a young twenty-eight years old. His young age combined with his astounding abilities is the primary reason that I chose to research him. Many art historians have commented on his early death, lamenting the fact that the world was never able to see his artistic ability mature even more. Given the speed at which he excelled in the few years that he was alive, there is no telling what Schiele would have been capable of. I chose the above painting because I wanted to demonstrate the fact that Schiele was capable of much more than paper-based sketches, even though that was his main medium. Schiele’s astounding learning abilities extending into watercolor, paints, and oils. 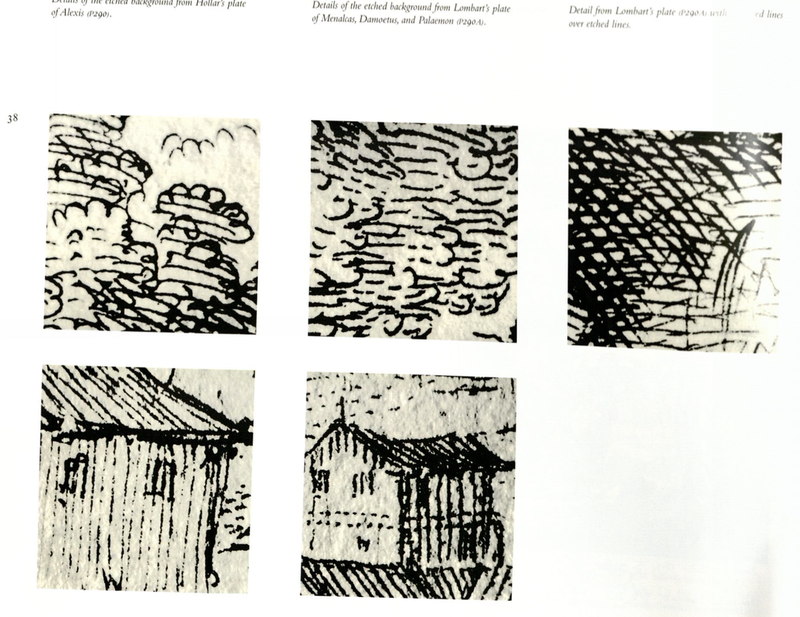 By comparing the above sketchy with the below sketch, one can begin to see the maturation that many art historians praise. Squatting Woman appears to be more “scribbly” while Girl in Underclothes has clean cut, more precise lines. Notice how the human form is more accurate as well. 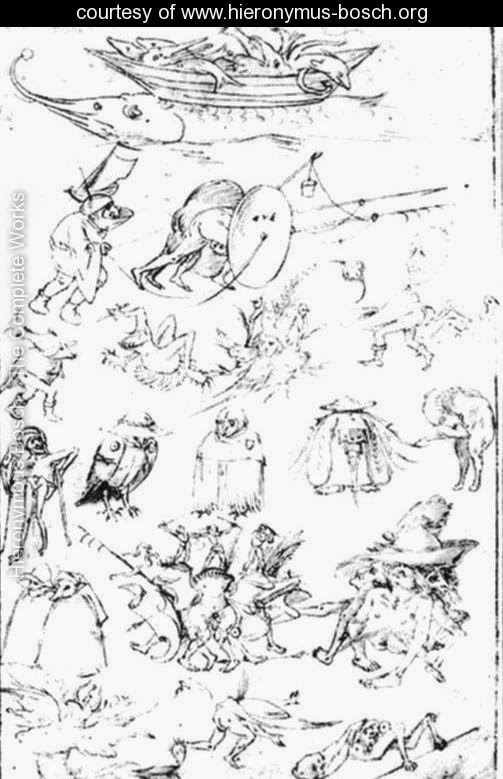 The above sketches are similar in that they demonstrate Schieles most common subject material. He would most often sketch naked women, but would also often do men. His figures are often placed in unusual positions and there is rarely a background. Kallir, Jane. 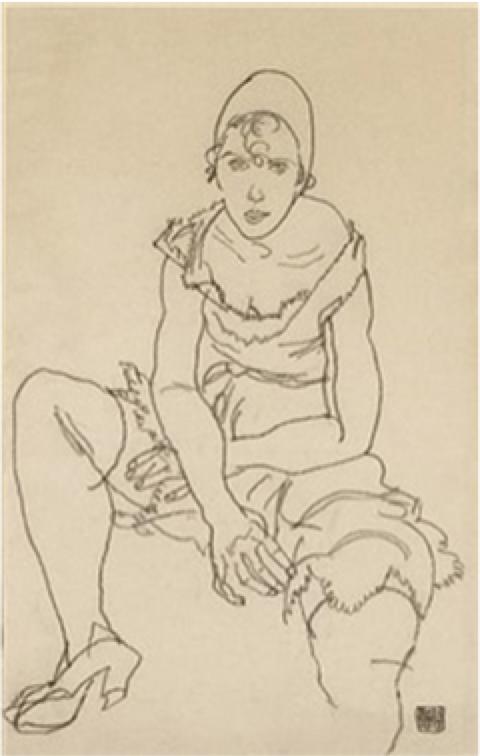 Egon Schiele: Drawings and Watercolors. Ed. Ivan Vartanian. London: Thames and Hudson, 2003. Print. “Egon Schiele (Austrian, 1890-19180).” Artnet. Artnet, n.d. Web. 04 Mar. 2015. Heironymus Bosch was a Dutch painter born in 1516 in the town of 's-Hertogenbosch, which was located just south of the present-day Netherlands. Bosch was descended from a line of painters and would marry into relative wealth, allowing him to pursue his craft and achieve substantial popularity during his lifetime. Bosch was, and is, best known for his hellish depictions of sin, often including grotesque demons, imps, and acts of lust and depravity. 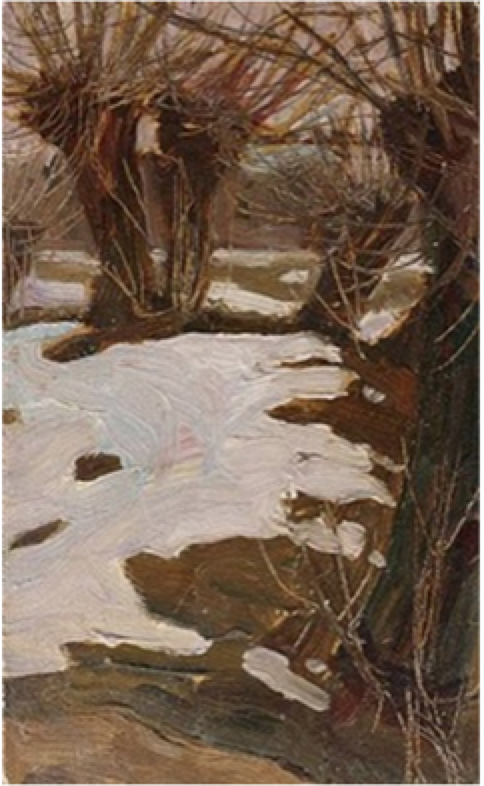 While he presumably produced a number of paintings by commission, only 25 can be conclusively attributed to his brush. Some of Bosch's most notable surviving paintings are triptychs - a three-paneled painting where the outer two panels may fold over the inner panel. Triptychs were frequently used as altar toppings, suitably matching the religious nature of many of Bosch's works. I find Bosch particularly interesting due largely to the fantastic critters found in his more famous works. Bosch's innovation could almost be seen as a precursor to surrealism in some cases, and I find the imaginative representations to be quite thought-provoking. 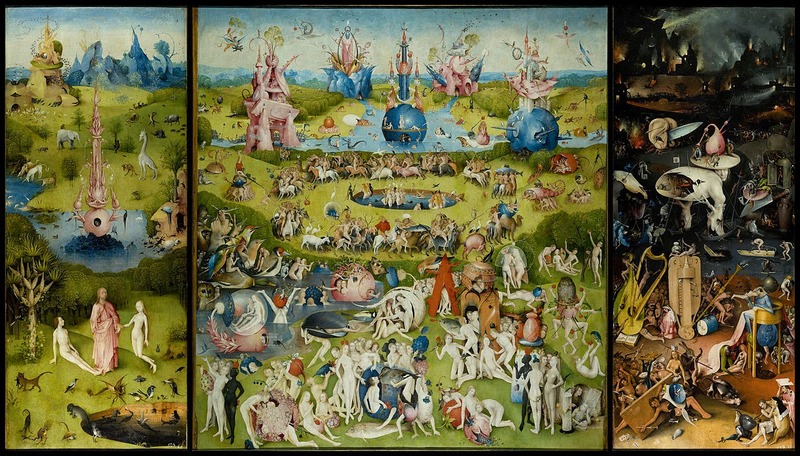 Perhaps his most famous piece, "The Garden of Earthly Delights" is a triptych whose three panels show the serene existence (left), sin and lust (center), and the resulting hell on earth (right). This painting is riddled with bizarre creatures and unfamiliar, imaginative structures. While relatively few of Bosch's completed paintings survived, a number of fantastic study drawings were recovered. In this study, Bosch explores a number of visualizations for various monsters and witches. In Bosch's "Adoration of the Magi," he channels the styling of Jan van Eyck and produces a piece representative of his final paintings. 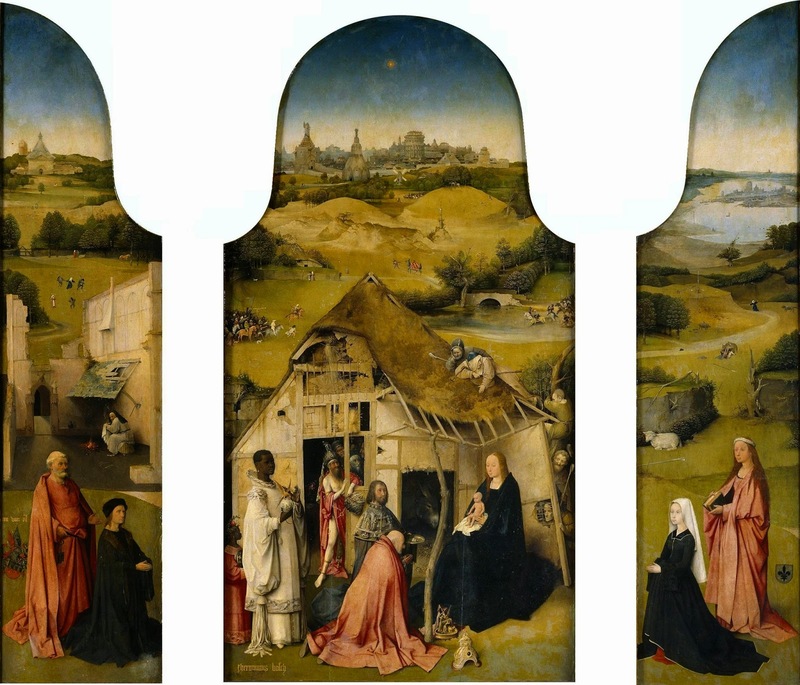 In "Adoration," he contrasts the colors of the robes to indicate the "duality of the eternal and the ephemeral" while framing the whole scene in a beautiful panoramic view inspired by the Master of Flemalle's Nativity (Tolnay). Cuttler, Charles D., and Hieronymus Bosch. Hieronymus Bosch: Late Work. London: Pindar, 2012. Print. Hieronymus Bosch: The Complete Works. www.heironymus-bosch.org. Web. Tolnay, Charles De. Hieronymus Bosch. New York: Reynal, 1966. Print. 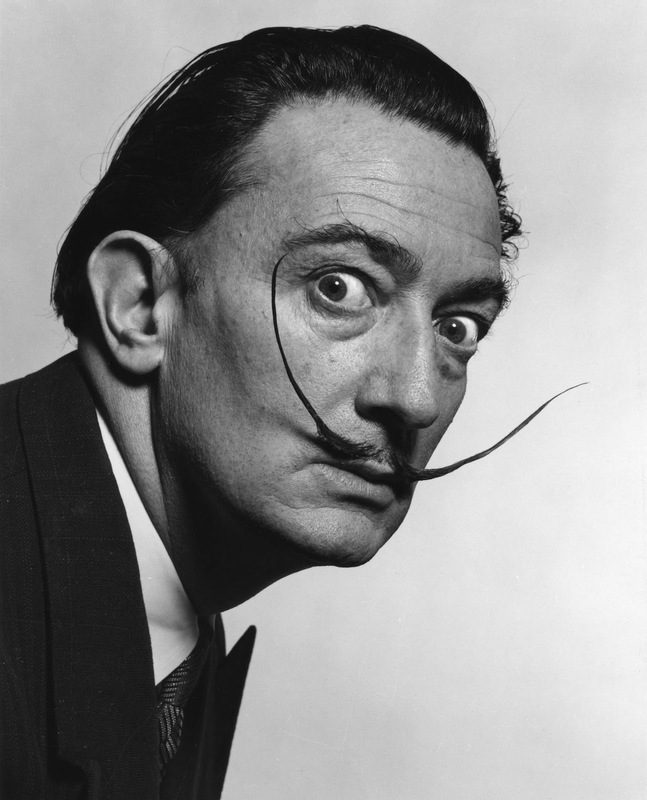 Salvador Dali is a Spanish painter world-renowned for his surrealism works. He was born May 11, 1904 in the town of Figueres, Spain. His deceased older brother had also been named Salvador, and being called the 'reincarnation' of his late sibling impacted his self-perception and art. At age 12 he attended a drawing school and by age 15 he displayed his first public exhibition of his work. 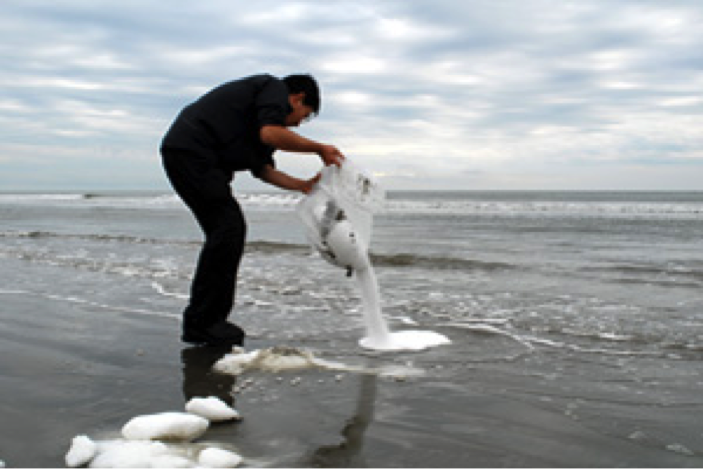 A year later, his mother passed away - another death that greatly shaped Dali as a person. Through his artistic upbringing, Dali experimented in many fields. He revered Picasso and in his youth pursued cubism as a unique style in Madrid to impress his peers. He also demonstrated mastery over realism, perhaps best evidenced by his work 'The Basket of Break', shown below. The fading due to age slightly detracts from the realism, but in the works prime, it appeared photo-realistic. The composition itself is fairly straightfoward - a basket of break nestled in white fabric on top of a table. The solid, dark background contrasts well with the lighter tones of the rest of the piece. I am most impressed with the bread in this painting (which is maybe surprising - many seem to most appreciate the basket); he is able to capture the relatively complex texture of slices of a crisp loaf of bread with a spongy interior. Soon after painting the 'Basket of Bread', Dali visited Paris and met with Picasso and Miro, a famous surrealist of the time. These men both greatly influenced Dali's work, especially early on. His marriage to Gala in 1929 introduced another key figure in Dali's life. The marriage strained ties with Dali's father, and it is thought that the disconnects with his family (deceased brother of same name, losing his mother, and being 'disinherited' by his father) greatly impacted his work. Dali's first surrealism works began as representations of his dreams (a focus on sleep and dreaming can be seen across many of his pieces) and grew into one of the most impressive surrealism portfolios to date. 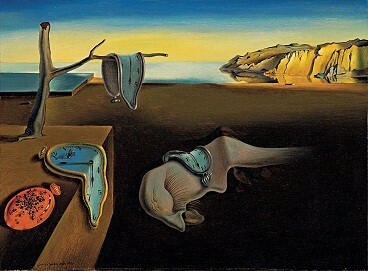 'The Persistence of Memory' is regarded as Dali's most famous painting. I have actually seen it numerous times at the MOMA! This work prominently shows three molten clocks and an overturned stopwatch covered in ants (which also appear in numerous Dali pieces). The sleeping figure centered in the piece also presents a familiar Dali-style creature. The clocks demonstrate a theme of 'hardness and softness' Dali would often experiment with. They also may convey the distorted sense of time when sleeping and dreaming. The ants are said to be a symbol of decay for Dali. Shown above is one of my favorite pieces by Dali, 'Sleep'. It depicts a large face precariously mounted on thin stilts, reflecting the notion that sleep is fragile and easily broken (i.e. waking up). 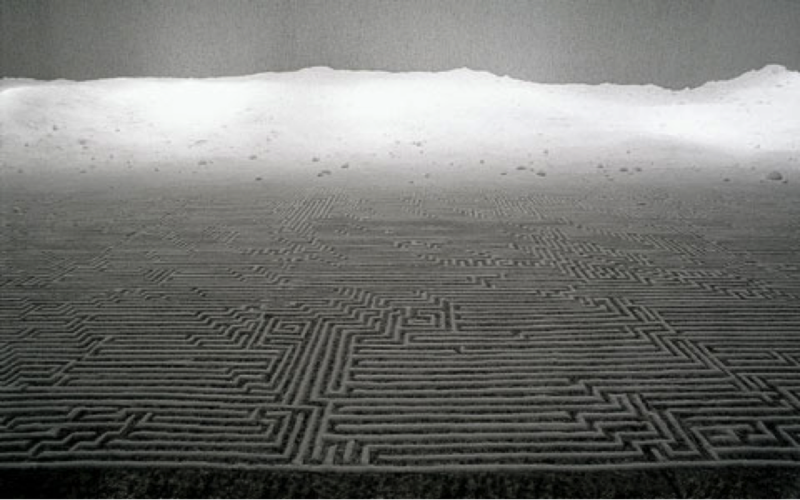 I find this representation of sleep to be fascinating and though provoking. Moreover, I love the style of painting - the face is undoubtedly ugly and misshapen, the background is almost barren and lighting overemphasized around the figure, and the face itself tapers off into an unsettling stretch of flesh (which is also carefully mounted on a stilt). 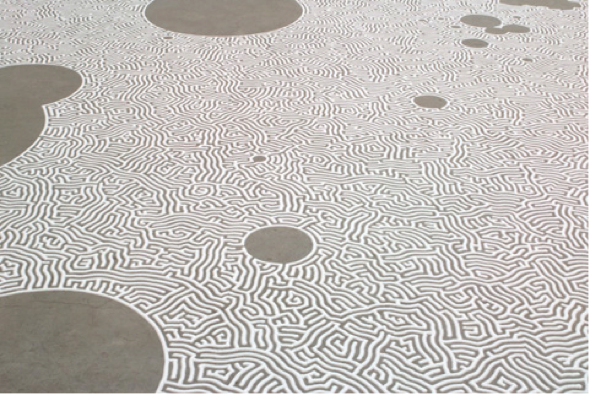 Saltworks by Motoi Yamamoto. Charleston, SC: Halsey Institute of Contemporary Art, 2012. Print. 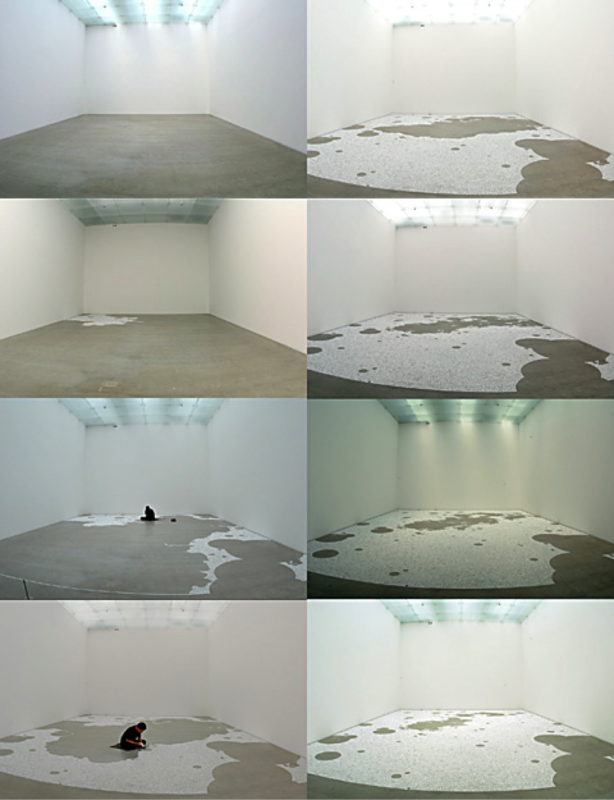 Yamamoto "Salt Installation, Artist" Motoi Yamamoto, n.d. Web. 04 Mar. 2015.